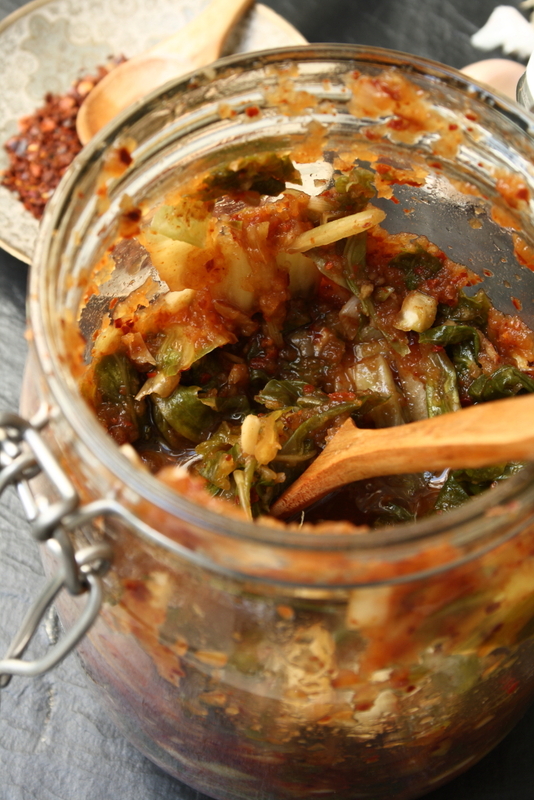 I think Kimchi is probably one of those Love or Hate things, like Marmite. I’m definitely a lover not a hater of both. I can see why you would be put off I suppose. I mean it’s fermented cabbage for want of a better description. Kids will love it. It’s my new favourite thing. If you have never heard of it, where have you been? 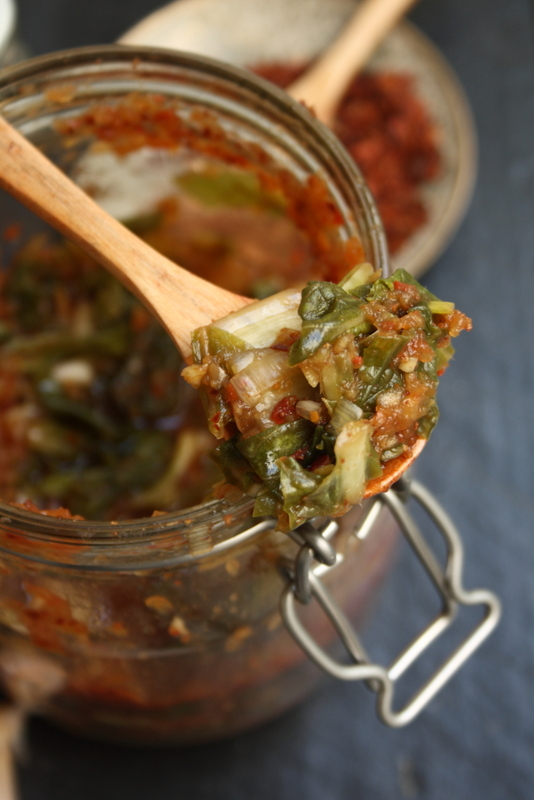 It’s a spicy Korean cabbage pickle (or condiment really) that can be used to liven up a huge amount of dishes. There are recipes using it all over the internet for Kimchi Fried Rice and Kimchi Pancakes among other things. It is a really versatile thing to have in your fridge for those “What are we having for lunch/dinner that only takes 15 minutes” moments. This recipe is healthier than most as it uses an apple for sweetness rather than the evil sugar monster. We like that. Makes 1 large jar, vegan, gluten-free, refined sugar-free. 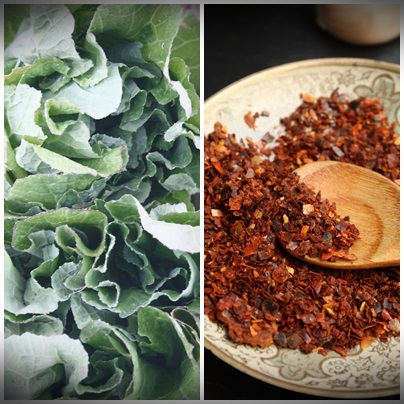 Discard any outer damaged leaves, separate off all the cabbage leaves, rinse and chop into bite-size pieces. Dissolve the sea salt in the bowl of warm water, pour it over the cabbage and mix it well. Leave it to sit for at least four hours. Rinse the cabbage well to remove excess salt then put it in a large bowl. 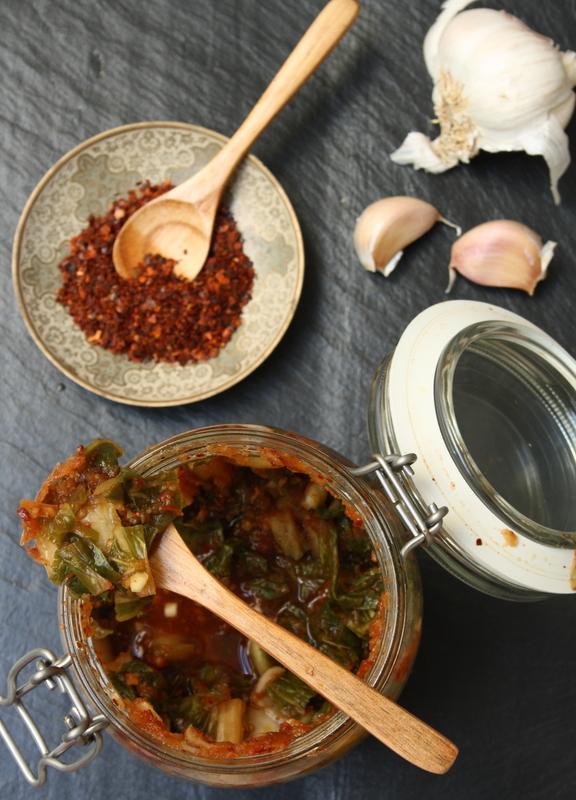 Mix the Korean chilli flakes with a few tablespoons of warm water to create a paste, add the minced garlic and ginger and stir together well. Pour this onto the cabbage, stir through the spring onions and fish sauce if using. Blend the cored apple with the 1/2 onion and about 200 ml (3/4 cup) water then add this to the cabbage as well. Mix everything together really well with a wooden spoon or with your hands (using gloves) to make sure everything is well-distributed. Transfer the cabbage with a clean spoon into a large sterilised glass jar or bottle, pressing it down well each time as you stack it up. Pour over any liquid remaining in the bowl but leave about 2 inches clear at the top of the jar/bottle before sealing it up. 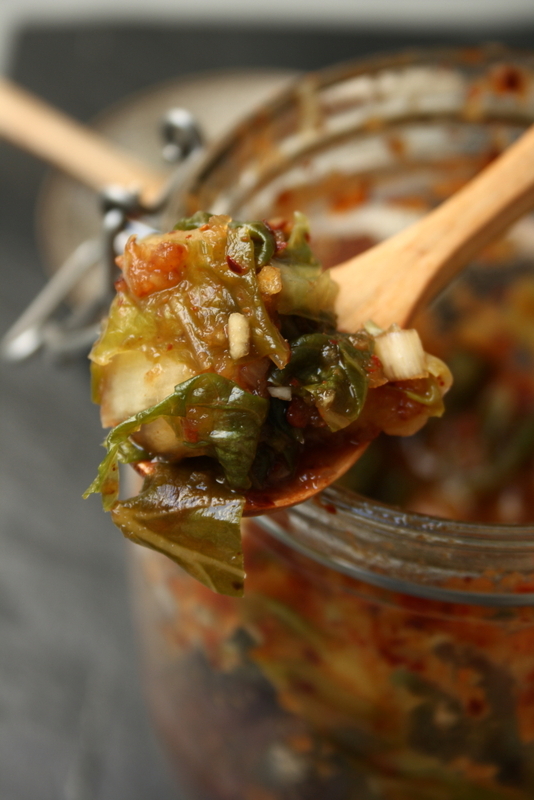 Leave the kimchi to sit at room temperature for 24 hours. The kimchi is now ready to eat. 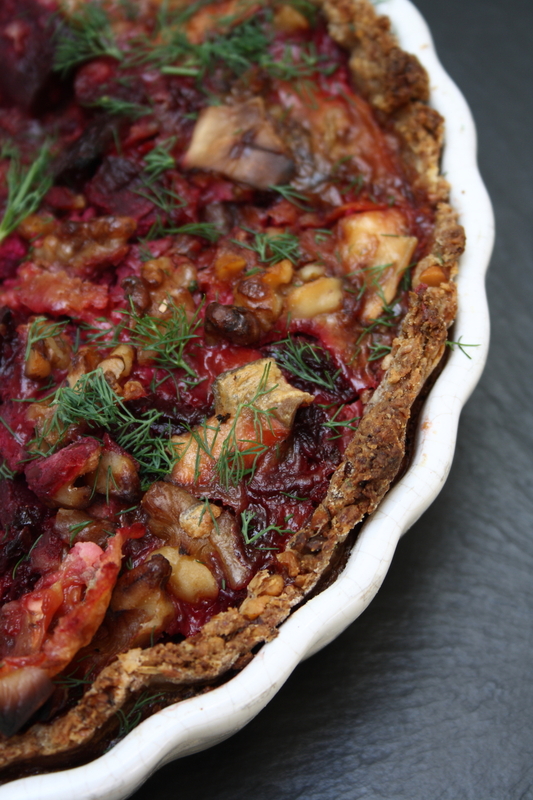 Store it in the fridge and it will continue to ferment slowly over time. As long as you use a clean spoon every time you take some out, it should keep for up to a month in the fridge. Add a big dollop of it to vegetable stir fries to add another level of flavour, or to this Soba Noodle Salad or this Mee Goreng. It’s great in Asian style soups with some miso. I love it sautéed with some broccoli, soy sauce and sesame oil which you can eat with noodles or add the whole lot to an omelette made with a bit of soy sauce or even some scrambled eggs. It is a fantastic thing to have around for food emergencies.